Real Madrid comes off a season that will go down in the history books. Los Blancos persevered despite a rash of injuries to claim their 10th EuroLeague crown and added the Spanish League championship to boot. Madrid lost reigning Turkish Airlines EuroLeague MVP Sergio Llull for the best part of the season and only two of its players managed to play all 36 EuroLeague games. At one point, Madrid had seven injured players and it lost its first chance to win a title when it fell to archrival FC Barcelona Lassa in the Copa del Rey final. Madrid remained competitive behind an unstoppable Luka Doncic, but finished the regular season in fifth place and did not have home-court advantage for its playoff series. What Madrid did have was most of its players back in time to face Panathinaikos Athens in their best-of-five affair. Despite losing Game 1 in Athens, Madrid bounced back with a road win in Game 2 and back-to-back triumphs in the Spanish capital - with Llull finally back in action - to advance to the Final Four. Madrid defeated CSKA Moscow in the semifinals and defending champion Fenerbahce Istanbul in the championship game to become the first club to 10 EuroLeague titles. Doncic completed a magnificent season in which he was chosen EuroLeague Rising Star, EuroLeague MVP and Final Four MVP. 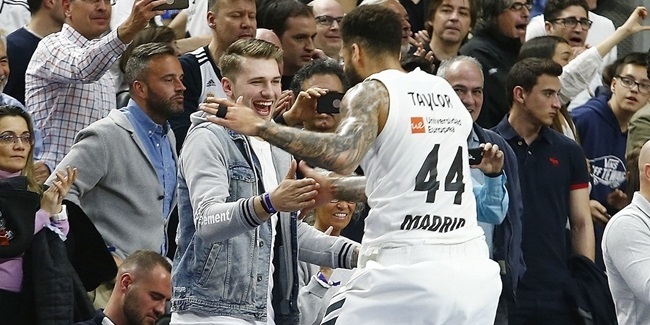 Madrid kept riding its momentum in the Spanish League playoffs, where it registered only one loss and downed KIROLBET Baskonia Vitoria Gasteiz in the title series. 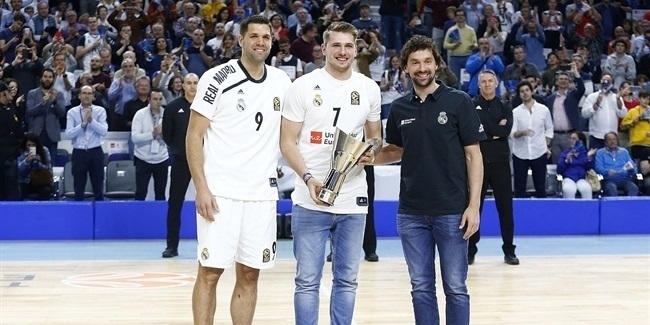 Doncic was also named Spanish League MVP and Rudy Fernandez claimed Spanish League Finals MVP honors. For more than half a century, Madrid has been a reference in European basketball as it has accumulated a record 10 continental titles. Its untouchable cache of 34 domestic league and 27 cup trophies says plenty about its status in Spanish basketball. Moreover, almost every time that Madrid has not played in Europe's top competition, it won a different continental trophy; its trophy case boasts four Saporta Cups, a Korac Cup and a ULEB Cup between 1984 and 2007 – all as stepping-stones back to the big time. Great players like Emiliano Rodriguez, Clifford Luyk, Wayne Brabender, Walter Szczerbiak, Juan Antonio Corbalan, Drazen Petrovic, Arvydas Sabonis, Dejan Bodiroga, Sergio Llull, Felipe Reyes and Luka Doncic have turned Real Madrid into one of the most-celebrated basketball clubs in the world. Madrid won four EuroLeague titles between 1964 and 1968 to establish itself as a juggernaut and added more titles in 1974, 1978 and 1980. Even though it took the club 15 years to win it again, Madrid found success in other European competitions, too; it lifted the Saporta Cup trophy in 1984, 1989, 1992 and 1997 as well as the Korac Cup in 1988. With Sabonis aboard, Madrid won its eighth EuroLeague title in 1995 by beating Olympiacos in the final. In 2007, Louis Bullock and Felipe Reyes helped Madrid to a new trophy, the ULEB Cup, and the Spanish League crown for the 30th time by besting Barcelona 3-1 in the finals. Madrid returned to the Final Four in 2011 and, with Pablo Laso as head coach, went all the way to the EuroLeague championship game in 2013 and 2014, but lost to Olympiacos Piraeus and Maccabi Electra Tel Aviv, respectively. Madrid was loyal to its fast-paced, fun-to-watch basketball and gained the experience and toughness required to be almost unbeatable in decisive games in the 2014-15 season, which was arguably the best ever for Los Blancos. Madrid finally went all the way by downing Olympiacos 78-59 to claim its ninth continental crown and its first since 1995. 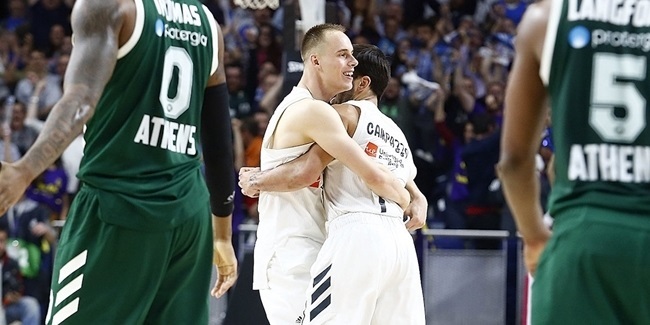 Andres Nocioni was chosen as the Final Four MVP and Reyes was an All-Euroleague First Team selection, while Rodriguez, Llull, Jaycee Carroll, Gustavo Ayon and Rudy Fernandez all played major roles during the season, too. Coach Laso's team also lifted the Copa del Rey and the Spanish League trophies to conquer the team's first triple crown since 1974. In the 2015-16 season, Madrid conquered the Spanish League and Cup double and added an Intercontinental Cup trophy for the first time since 1981. Madrid won another Copa del Rey in 2017 and had an unforgettable 2017-18 season in which the team overcame injuries to win its 10th EuroLeague title and its 34th Spanish League crown. Doncic was chosen as the EuroLeague Rising Star, EuroLeague MVP, Spanish League MVP and EuroLeague Final Four MVP, and Fernandez earned Spanish League Finals MVP honors. In just seven seasons, Coach Laso has led Madrid to 17 of a maximum 21 finals between the Spanish League, Spanish Copa del Rey and EuroLeague, winning 11 of them to make Los Blancos the team to beat in European basketball.